I am a Ukrainian wife - born in Ukraine, got married to Canada. My husband and I met online, like thousands couples nowadays. We are happily married since 2007! Since 1991, when Ukraine became independent country, more and more Ukrainian couples prefer to get married in traditional Ukrainian costumes, like their ancestors did in past centuries. 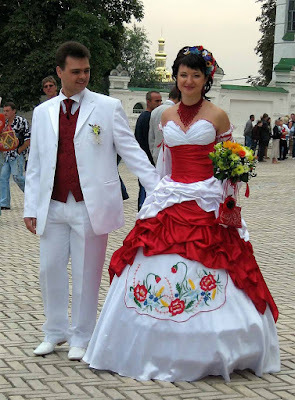 Some brides are using just few elements of Ukrainian style in their wedding wear, like embroidery or hand crafted beaded necklace, and some grooms just wearing a Ukrainian embroidered shirt to the formal suite. Sometimes all the guests on Ukrainian wedding are wearing traditional costumes. This tendency is especially strong in Western Ukraine (Lviv, Ternopil, Ivano-Frankivsk, Chernivtsi, Uzhgorod, Rivne and Volyn regions). Here you can see some pictures from the weddings in Kyiv (capital of Ukraine), Lviv and Ternopil cities (Western Ukraine). Elena’s Models: How It Works? How I Became An Online Matchmaker? Let Internet To Be A Saint Valentine To You! My Online Matchmaking Hobby: One Marriage Per Year! What Bridesmaids And Groomsmen Are Suppose To Do At Ukrainian Wedding? Subscribe to Your Ukrainian Matchmaker by Email! It"s simply! Elena's Models: How It Works? © 2007-2018 Life With A Ukrainian Wife. Simple theme. Powered by Blogger.